Octave began as one painting, Leap, exhibited with more of my paintings in Selly Oak in January 2013. The then clerk to the Trustees of the Westhill Endowment, John Walmsley, quite took to the painting, saying that he wished there were “a lot of little Leaps.” I believe he was indicating a series of small paintings with big ideas, able to spark off conversations about being human. 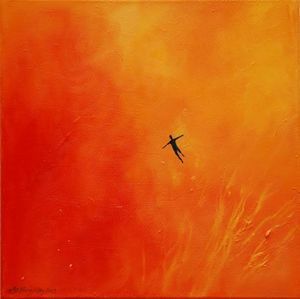 My mind wandered and I saw in Leap the contrast of the relaxed person free falling into flames; how could one be relaxed in the face of such drama? It was the contrast which then inspired me, and I concentrated on simple action words which people use in daily life. Alongside Leap grew Hear, Watch, Fly, Chill, Call, Wait and Be. 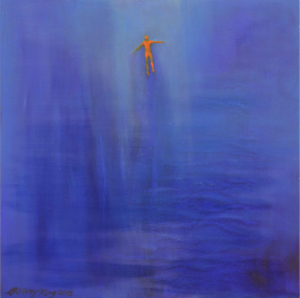 Six of the paintings are a small person in a contrasting environment to the word; so, Fly is a person swimming up from depths of water, Chill is a very relaxed person sitting on a cliff edge, Call is a tiny person sitting high up in the branches of a forest. Further contrast is that each person is a single non-human colour and the background is the opposite of that colour. Wait is a yellow person in a deep purple cave, Watch is a green person on the edge of a deep red sunset, Leap is a blue person leaping into bright orange flames. Hear is stripes, each with colour contrast. Be is a series of curved squares, each in some human hue, all hues made with the reds, yellows and blues of the other paintings. Octave in Westhhill’s hands will be the paintings fitted to easels and accompanied by information packs, and coming with bespoke packing cases. The set will be part of the Westhill travelling exhibition resource, able to be set up in any venue with no extra need for fittings and fixtures.